This talk will describe more than five decades of progress as well as some recent developments in our understanding of shock-driven instabilities that are observed when an interface between disparate media is impulsively accelerated. Even miniscule undulations at the material interface grow under the influence of baroclinic vorticity deposited by the shock, and eventually serve to vigorously mix the two (or more) layers of pure fluids. Such a shock-driven flow is termed the Richtmyer-Meshkov instability, and can be observed in many situations in nature and in engineering applications. For example, in laser-driven nuclear fusion, instability-driven mixing is harmful to the objective of maximizing yield, while the opposite is true for Scramjet combustion where instabilities can drive the process to higher combustion efficiencies. The Richtmyer-Meshkov instability is also an important ingredient in explaining supernovae detonations, where stellar models that neglect mixing fail to reproduce the observed light curves. I will highlight recent numerical simulations that have expanded our understanding of how the instability progresses under a variety of conditions including convergent geometries, inclusion of material strength effects, and in chemically reacting flows. 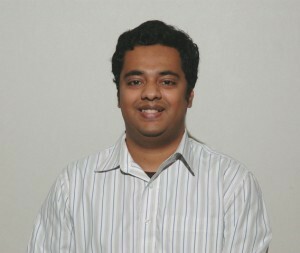 Dr. Praveen Ramaprabhu is an Associate Professor of Mechanical Engineering & Engineering Sciences at the University of North Carolina at Charlotte, where he directs the Laboratory for Multiscale Computational Fluid Dynamics (LMCFD). Starting with his Ph.D. research at Texas A&M University, Dr. Ramaprabhu has worked extensively using experiments and careful numerical simulations to advance the understanding of turbulent mixing due to fluid instabilities. Dr. Ramaprabhu is a senior member of the American Institute of Aeronautics and Astronautics and an Associate Editor of the ASME Journal of Fluids Engineering.